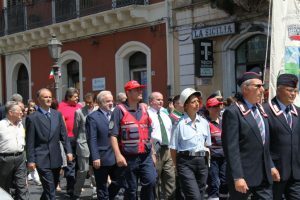 A quite remarkable series of events took place recently in the Municipality of Piedimonte Etneo in commemoration of the men of the two battalions of the London Irish Rifles who served in Sicily during the summer of 1943. In particular, the community remembered the men of the 1st Battalion (1 LIR), who stayed in Piedimonte Etneo for 33 days from 8th September to 11th October 1943. 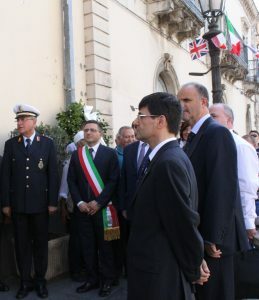 In the morning, the Municipality’s Town Council unanimously voted to confer “Honorary Citizenship” on the Regimental Association’s President, Major General Purdon, and Chairman, Major Peter Lough, and the Mayor of Piedimonte Etneo, Dr Ignazio Puglisi, passed over framed scrolls of Honorary Citizenship to Richard O’Sullivan, who was representing the Regimental Association. Following the meeting of the Town Council, there was a procession to the Cathedral of Our Lady of the Rosary where a short commemorative ceremony was held at the town’s monument. Later in the day, a conference at the Capuchin Convent was held to share memories of the wartime period, which included personal accounts from the townspeople of Piedimonte Etneo. The conference was moderated by Giuseppe Pagano and Dr Felice Vito Vitale with historian Rosario Raciti reviewing the whole period of conflict in Sicily. 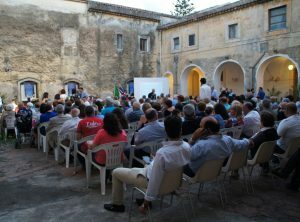 Over two hundred people packed into the convent courtyard to watch a visual documentary, which included some particular evocative testimonies from those who had witnessed the events of 1943. Some remembered the London Irish Rifles’ Pipers entering the town wearing what was described at the time as ‘orange skirts’ and there was a very amusing story about the possible ‘shared’ identity of General Montgomery and 1 LIR’s Second in Command ‘Monty’ Stopford. Additional thanks of the Regimental Association are due to Charlotte Luisa Abraham who provided a most excellent translation and interpreting service throughout the whole day.